Our friend Tim of the Buffalo GameBuffs Blog posted a nice review Thursday of some big board games. These are the kind of extra-large games often marketed as summer backyard activities, but you might want to consider them for upcoming holiday parties or family get-togethers. And posting it now also gives people time to save up for some of those expensive giant games :) But yeah… they would be fun at an upcoming party and even a new years eve party. 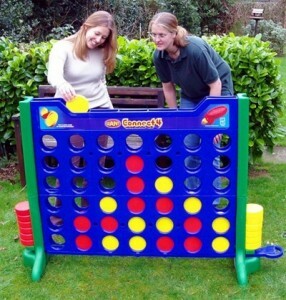 where can I buy an extra large connect four game?